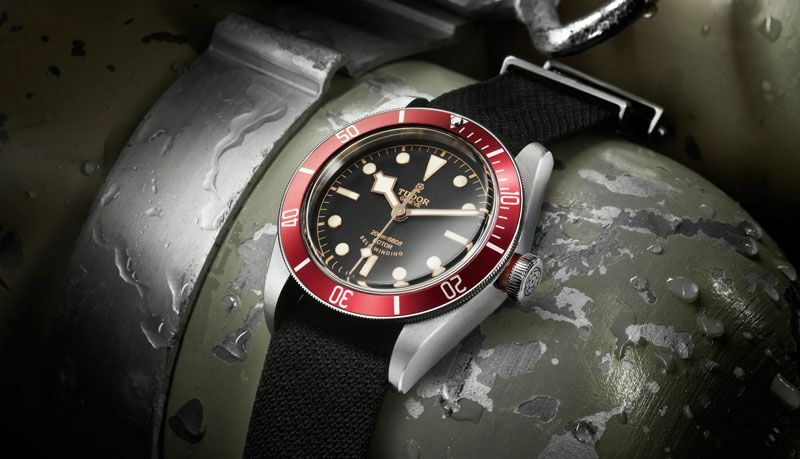 While Baselworld 2012 offered quite some mind-blowing novelties, two new dive watches from Tudor were on everybody’s tongue. The Tudor Heritage Black Bay and the Tudor Pelagos are both loaded with design elements of vintage Tudor Submariner models from the past. 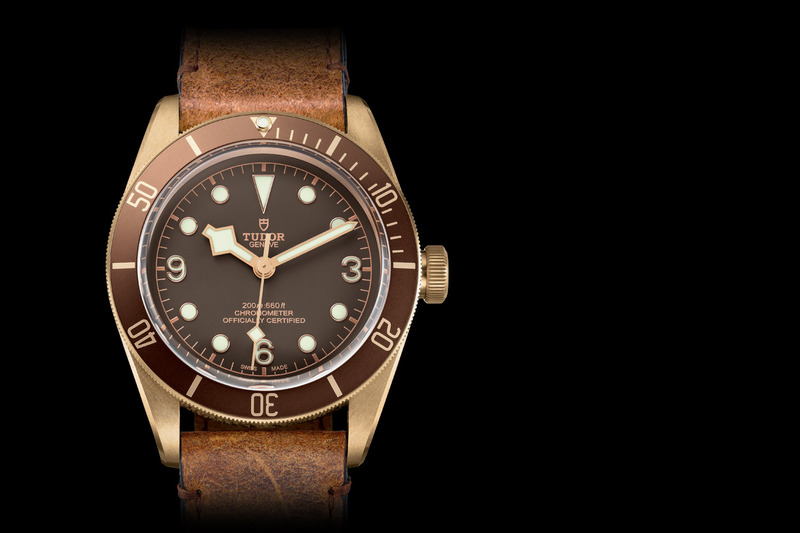 The new Heritage Black Bay combines elements of the Tudor Submariner ‘Snow Flake’ ref. 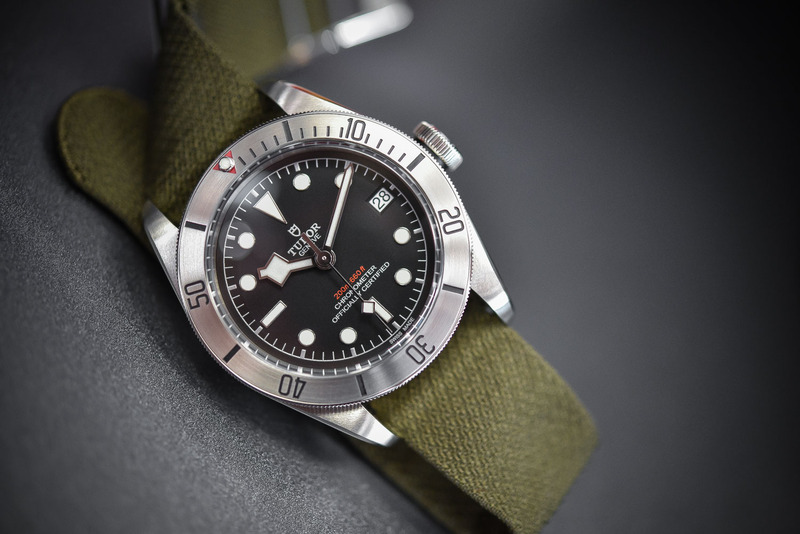 9411 and the Tudor Submariner ‘Big Crown’ ref. 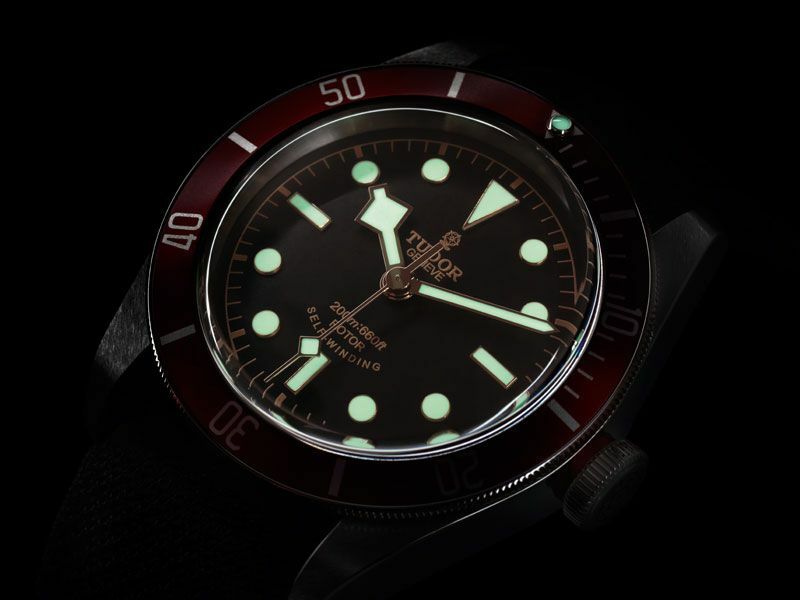 79220R, that shares the same dial design with the early models like the Tudor Submariner ref. 7928 Mk.I or Mk.II. The Heritage Black Bay also has a depth rating that’s similar to that of vintage Tudor Submariners, which is 200 meters. What’s missing is the word Submariner?!? 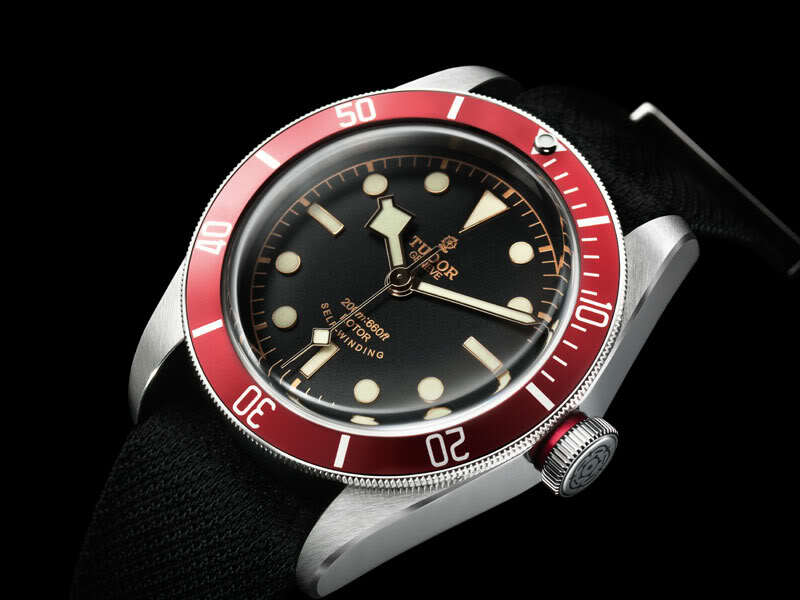 It’s actually a strange mix of design elements of different vintage Tudor Submariner models, that Tudor used on the Black Bay. But it did boil down to a very beautiful dive watch with vintage looks and modern specifications. The Heritage Black Bay sports a stainless steel case, with a diameter of 41 mm, that features the typical submariner-style polished and satin finish. However it doesn’t have crown guards, like most other Submariners had. The absence of the crown guard and the relatively large crown are design elements referring to the vintage Submariner ‘Big Crown’ models. 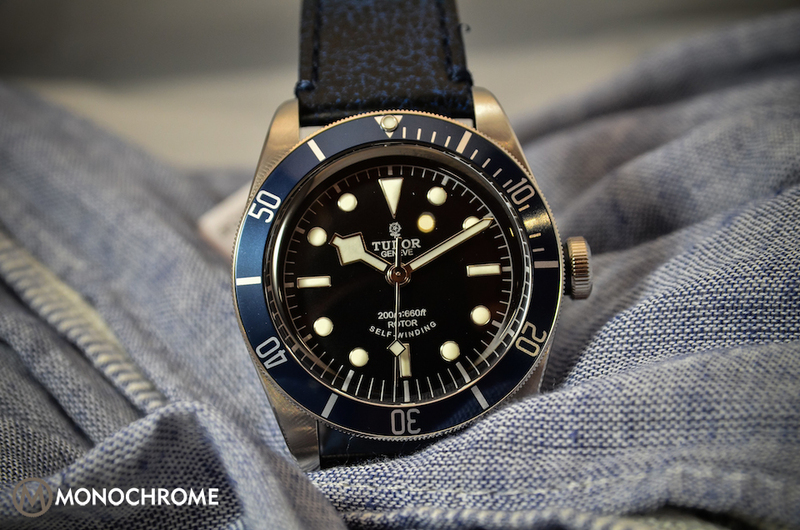 Strange enough Tudor themselves show a picture of the Heritage Black Bay together with a Tudor Submariner ref. 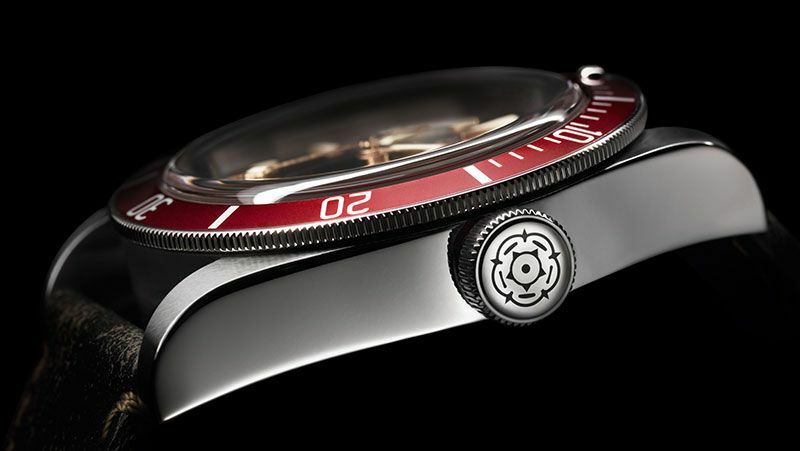 7923, that features two straight lines of text on the lower half of the dial. Something that doesn’t resemble the curved line of text that featured on many other vintage Tudor Submariners. 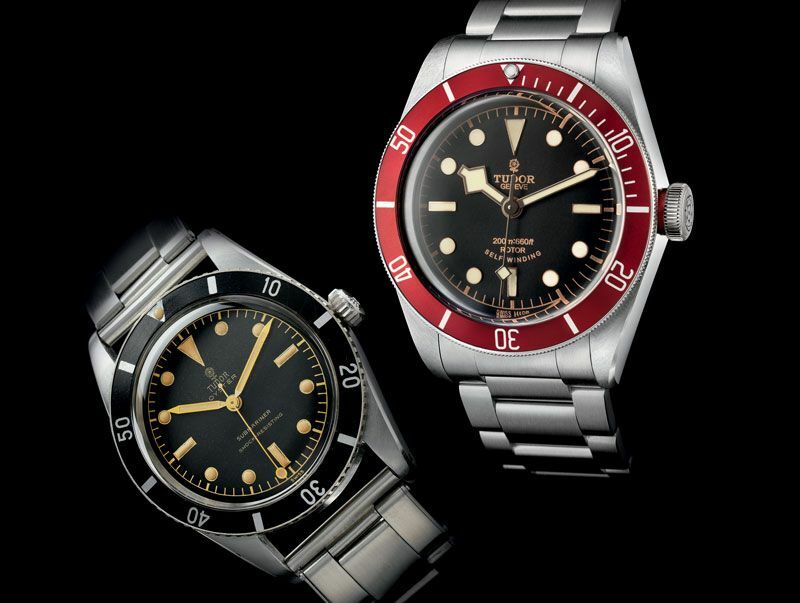 In fact, that is the one vintage Tudor Submariner that has the least resemblance with the new Heritage Black Bay. The dial does feature a chapter ring that could be found on the vintage Submariner ref. 7922, ref. 7923, ref. 7924 and the Mk I and Mk II versions of the ref. 7928. The red bezel insert looks more red on the press photo, than in real life. It is in fact a burgundy red, which resembles that of vintage Submariner from the 1970’s. Yes indeed a visual reference to yet another era. A touch of burgundy red also appears on the insert of the crown. The black dial is slightly domed and its hour markers have applied super luminova, like the ‘snow flake’ hands. The hour markers and the pink gold of the hands matches perfect with the gilt printed rail track and writing on the dial. Equipped with the new folding clasp developed by Tudor, the Heritage Black Bay model is delivered with a black fabric strap and a steel bracelet, or with a black fabric strap and a second strap in aged leather: another original touch for an elegant, contemporary watch. Alltogether maybe a strange mix of visual references to vintage Submariner, but it works. 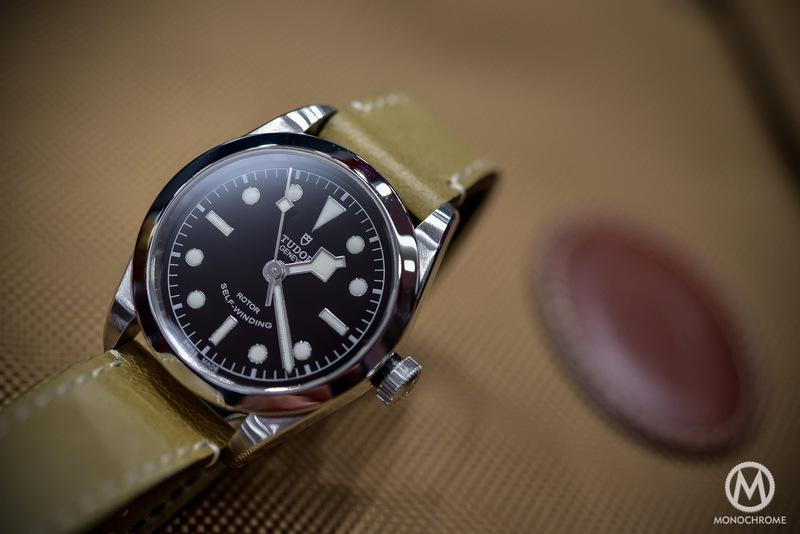 The new Heritage Black Bay looks great and I’d love to strap it on the wrist. Inside tick the ever reliable ETA 2824, so that will most likely give many decades of precise timing.Although Tudor removed the word ‘Submariner’ from the dial, this looks and feels like a new/vintage Tudor Submariner. The Heritage Black Bay has quite a competitive price of CHF 3,250 with the stainless steel Oyster bracelet or CHF 2,950 with the leather strap (both choices come with an additional Nato strap and prices include vat/tax). What can I say more…. it looks magnificent, the price is good and I want one. 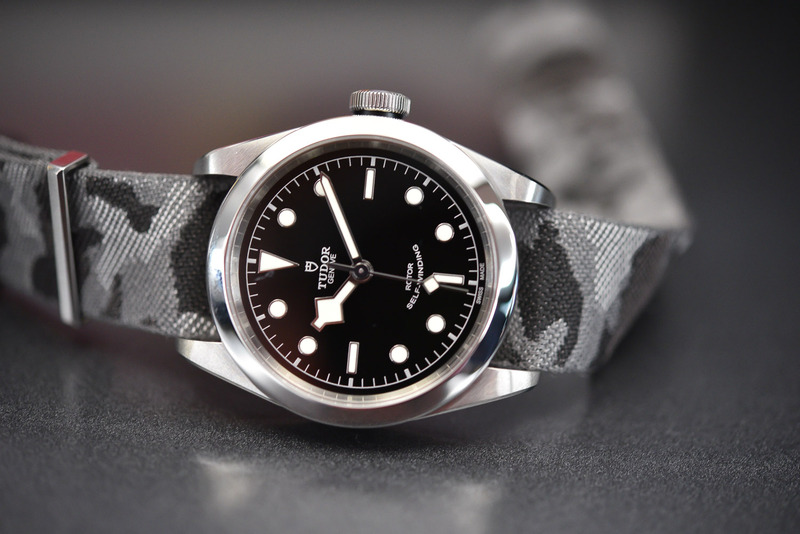 Tudor made some magnificent press photos, that also add to me wanting this watch. For more information, please visit the Tudor website. This article was written by Frank Geelen, executive editor of Monochrome Watches. Do you know where one might get acceptable prices for purchasing this watch? I think that the official retail price is quite an acceptable price for this piece, so you can check with your official dealer. Since it’s a very new piece I don’t think used versions are widely available right now.